Buying your dream holiday home – will it make a good rental property? Summer is finally here and it’s the time of year when we all start dreaming of owning our own holiday home and enjoying endless sunny days by the sea. But is buying a holiday home really a good financial decision? Is there a way to make a holiday home purchase work as an investment as well? We’re all guilty of spending part of every holiday gazing into real estate agent’s windows and wondering if (or when) we’ll be able to afford our own slice of paradise. And if you take out a holiday home rental when you go away on holidays, you’ll be fully aware of how much they cost and the great returns they can bring! However, owning your own holiday home and owning an investment property in a holiday location are two very different propositions. If you are buying a holiday home entirely for your own use, your primary considerations will always be about how you and your family will use the property. You’ll be looking at the location to assess whether or not it will facilitate a good holiday for your family members – is there enough accommodation for the whole family, does it provide the sporting options and facilities your kids will want, is it close to your relatives if that is important to you? Buying a holiday home for your own use could be a good financial decision if you have the funds to pay the mortgage on your second home without the assistance of rental returns, and you buy in the right location. However, the right location is key to ensuring your purchase proves to be an increasingly valuable asset over time. The location offers attractions such as vineyards, watersports, amusement parks etc. The market is not oversupplied with holiday homes that can’t be sold or rented. When buying a holiday home for investment purposes, your considerations and objectives will be different than if you were buying a property for your own use. That’s because the primary purpose of an investment property is to earn you money, not provide you with a second residence. When buying any investment property, it is very important not to make an emotional decision – profit should always be your first consideration. Will it be easy to find tenants? Will it earn enough rental returns to cover your costs? Will it provide you with a capital gain over the period of time you plan to own it? Can you cost-effectively improve the property to increase your capital gains? Does the property have the access and lifestyle considerations that make a good holiday home? Will these attractions develop further in the future? When making your property investment, you also need to remember that getting a regular rental return from a holiday investment property may be more difficult than with an ordinary investment property. That’s because demand for holiday homes tends to be seasonal. It may be easy enough to find tenants during the peak summer holiday season, but it might not be so easy to find them year round – especially for seaside purchases. So, where does that leave you in terms of enjoying your holiday investment home for your own use occasionally? Trying to get the best of both worlds – a holiday home for your family that is also an investment that covers its own costs – may prove to be difficult. However it may be possible to rent out the property some of the time to help cover some of your costs. We’re here to help you decide what option is right for you. We’re always happy to crunch the numbers for you to see if your plans are financially sound. We’re also happy to help you structure your loan and find the right financial products to maximise your investment property buying power. If you’ve been dreaming about a holiday home of your own, or are planning to buy an investment property in 2016, then please give us a call. We’ll be happy to help. Christmas is just a few weeks away and we’re all looking forward to a summer break after a very fast-paced year in our property markets. Our last newsletter for 2015 focuses on your goals, financial health and getting ready for another busy year in 2016. The Reserve Bank of Australia (RBA) met for their final meeting for 2015 last week, but there was no rate cut to give mortgage holders an early Christmas present. The official cash rate remains on hold at 2.0 per cent. The RBA will not meet again until February 2016, so the cash rate will stay at this level at least until then. The question is, can we expect further rate cuts in 2016? Home value growth looks set to slow down next year and this may give the RBA room to make a further cut. Analysts predict that the sluggish performance of our economy over the last year may prompt a move, but according to RBA Governor Glenn Stevens, this will depend on the economic data. Sanity appears to be returning to the Sydney and Melbourne property markets, with both showing declines in home values and auction clearance rates during November. This is good news for first home buyers, and for property investors trying to enter the market. In Sydney, home values fell by 1.37 per cent during November, but were still showing growth of 12.82 per cent over this time last year. Melbourne home values declined by 3.45 per cent, but were up by 11.82 per cent year on year. Canberra was down by 0.50 per cent but showed an increase of 4.52 per cent year on year. Hobart was down by 2.38 per cent, but showed an increase year on year of 1.12 per cent. Adelaide home values rose by 0.69 per cent last month and by 3.27 per cent year on year. Perth home values increased by 0.33 per cent last month but declined by 4.13 per cent year on year. Brisbane and the Gold Coast saw a rise of 0.44 per cent and a rise of 4.45 per cent year on year. Despite the RBA keeping the official cash rate on hold, interest rates have been on the move in October and November. Lenders have increased rates for property investment loans in line with APRA’s regulations and some lenders have also made slight increases to home loan interest rates for owner occupier home loans. In this issue, we’ve included an article about getting a home loan health check and if you’ve had your loan for a while, we believe this is really important. We can assess whether your home loan is still the right product for your needs, personal circumstances and goals and shop around to compare your loan to what’s available on the market now to see if we could save you money. If you’re a property investor, we’re also very happy to help you formulate your plans for 2016, so please give us a call today. We’d like to take this opportunity to wish you and your family a very happy holiday season and a safe and prosperous new year. We look forward to another great year of working together to achieve your financial goals in 2016. The information provided in this newsletter is general in nature and does not constitute personal financial advice. The information has been prepared without taking into account your personal objectives, financial situation or needs. We recommend that you seek independent financial and taxation advice before acting on any information in this newsletter, and you consider whether the information is appropriate for your circumstances. Your full financial situation will need to be reviewed prior to acceptance of any offer or product. Interest rates are subject to change without notice. Lenders terms, conditions, fees & charges apply. A home loan isn’t just a debt, it’s a great financial tool that you can use to build wealth and facilitate your lifestyle. That’s why few people keep their original home loan for the life of the loan – it pays to keep it up to date to meet your needs as circumstances change. Refinancing your home loan means replacing it with one that better suits your current needs – and it’s something you may consider for a variety of different reasons. Here are the top four reasons why you might consider refinancing your home loan. The top reason why people talk to us about the possibility of refinancing their home loan is because they may now be eligible for a better interest rate. Cutting back on the interest you pay could reduce your repayment amount and save you a considerable amount of money over time. When you first apply for your home loan, your financial circumstances are one of the factors that influence the home loan interest rate available to you. As your personal situation improves over time, you may be able to refinance to get a better interest rate. Additionally, you can often get a better interest rate by switching lenders. For example, the big four banks recently made a move to raise interest rates outside of RBA movements. However, not all lenders raised rates at the same time, with many of the smaller lenders keeping their rates between 0.20 and 1 percent lower than the bigger lenders. If your lender raised your rates recently, now may be a good time to ask us to shop around for a better deal that could save you money. Property investment is currently one of the most popular ways of building wealth for your future. Whilst saving the deposit to purchase a second property may be difficult for many, rapid rises in property values in recent years have provided an opportunity to refinance in order to access some of the equity in their homes to use as a deposit instead. The equity in your home is calculated by subtracting the amount you owe from the current value of your home. In order to refinance to access your equity, you will need to have your home valued to determine its current value. Accessing your equity will increase the amount you owe on your original property and increase your mortgage payments. However, if you use the equity to make a property investment, you will have the opportunity to capitalise on home loan value increases on two properties over time and this has the potential to help you increase your wealth in the long run. Other uses for a lump sum in cash are literally endless – you could use your equity to buy your family a boat, a caravan, the overseas holiday you’ve always wanted or even use it to invest in a business or stocks and shares. However, we encourage you to act responsibly and only access your equity for lifestyle reasons if you can genuinely afford it. That means talking to us to help you discover your real financial position and if accessing your equity is a good idea for you. Renovating or extending your current home to meet the needs of your growing family or changing lifestyle is often a better option than purchasing an entirely new home. By renovating or extending, you will be able to create the home that exactly meets your needs and if you’re careful about the improvements you make, perhaps even increase its value at the same time. Even though you will need to access your equity, you may be able to improve the value of your home to offset this cost. Maintaining the value of your largest asset is important. So even if you don’t want to extend your home, keeping it up to date and in good repair is something you should consider periodically. If your home could do with an update, don’t hesitate to talk with us about refinancing to renovate. Your home loan interest rate is probably the lowest form of interest you will need to pay on any loan in Australia. Credit card interest rates can be as much as four times higher than your home loan interest rate and this can make credit card debts difficult to pay off. Other expensive debts like car loans or personal loans can also prove to be a drain on your finances. If the value of your home has increased over the last couple of years, it may be worth considering accessing some of the equity in your home to pay off your more expensive debts. This could dramatically reduce the amount of interest you have to pay on your overall debts each month, offering you some financial relief and helping you to enjoy a more comfortable lifestyle. It’s a far better idea to be in a position to save money each month rather than waste it on expensive credit card interest repayments. By refinancing to consolidate your debts, you could possibly find yourself in a position to save money to make other investments or even pay off your home loan sooner. Ask us to help you crunch the numbers to see if using your home loan to consolidate your debts will be a good idea for you. If you have plans or goals for your future then remember, your home loan can be used as a financial tool to help you reach them. We’re here to help you make the most out of your home loan, so please don’t hesitate to give us a call for a chat about what you want to achieve and how refinancing your home loan could help to get you where you want to be. We’re always happy to spend the time with you to help you make the right decisions to reach your financial goals, so please call us today. 2. 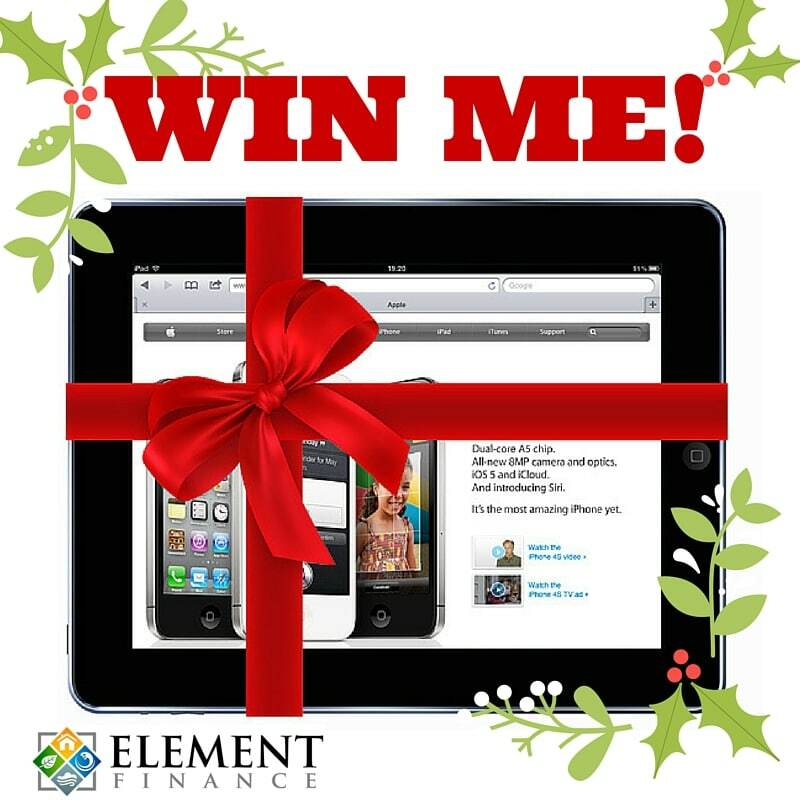 Visit the Element Finance page and comment on iPad image with the name of your favourite (or least favourite!) Christmas carol. Many Australians may not have adequate income or mortgage protection insurance cover in place to service their home loan repayments and living expenses in the event they lose their job, or suffer a serious illness or injury that would make them unable to work. In fact, while most of us have car insurance, it’s been estimated that only 6% of us have our own income adequately covered! As your mortgage broker, we adhere to certain ethical lending practices that are required by law. One of these requirements is to do our best to ensure you suffer no hardship when it comes to repaying your home loan. That’s why we always discuss your insurance arrangements with you when you apply for a home loan through us. There are several different types of insurance that you could use to cover yourhome loan repayments in the event you were unable to earn an income. The cost of income protection insurance is usually tax deductible for most people (you’ll need to check with a qualified tax adviser to see if this is the case for you). However, not all insurance policies are tax deductible. Why should you get insurance cover? Taking out a home loan can be an expensive exercise, there’s the deposit, application fees, inspections, conveyancer – the list goes on. Income or mortgage protection insurance can just seem like an additional expense that you can choose to avoid. But what you need to consider is: can you afford not to have it? If you couldn’t work for six months, how would you support yourself and yourfamily? Would your savings be enough to cover your home loan repayments for an extended period of time, or would you be at risk of losing your home? As you can see, there are plenty of events in life that could affect your capacity to earn a regular income. Planning for the unexpected could be very important to your well-being, your family and your financial future! We can help you find an income protection policy that provides the level of cover you need according to your personal situation and financial circumstances. Getting it organised could be as easy as giving us a call. So don’t spend another moment worrying about what the future may bring – if you need to arrange insurance cover or want to check if your cover is adequate, please give us a call today. We’re here to help you decide exactly what insurance you need and help you find the cover to suit.